Niti Aayog, the government’s top policy think tank, is looking to curb the menace of fake drugs in the country by using blockchain, said a media report. The think tank is looking for proof that the concept works by the end of this year and a rollout the next year, said the report in FactorDaily. “We are all taking those medicines and I am sure people are dying. One way to reduce that is to put the entire supply chain on the blockchain,” an official said in the report. This means tagging every medicine with a code so that its movements on the supply chain can be monitored via the blockchain. This will make the drug industry transparent and, to an extent, incorruptible. “Every time the medicine changes hands, the unique number (generated at the manufacturing stage) is tracked. When the consumer gets the drug, there is a QR (quick response) code or barcode on it… you can open up an app, and check the details of where it was manufactured and all the places where it changed hands to travel to the shop,” the official said in the report. “Once you have sold it, the code gets irrevocably audited on the blockchain that this ID has been sold, and it no longer exists,” he added. In the report, another official said that the private company to set up the blockchain technology has been identified. “Whenever drugs are transferred, there is an hierarchy of barcodes. We have identified a company that will do the technology for us. Now we have to identify a partner and do a proof-of-concept solution,” the official said. The report also claims that, though the pharma sector is excited about the opportunity to curb fake drugs, it is also worried about the expenditure to set up the tech and keep it running. The move by Niti Aayog comes at a time when the menace of fake drugs seems widespread in India. A WHO (World Health Organization) report has shown that India produces at least 35% of fake drugs globally. In addition, another report from industry lobby Assocham claimed that nearly 60% of all dietary supplements sold in India are either fake or unapproved by the drugs regulator. Apart from drugs, the government has been vocal about the use of blockchain in several other sectors. Union finance minister Arun Jaitley in his Budget speech had said that the government will explore the use of blockchain proactively for ushering in a digital economy. “A distributed ledger system or blockchain allows organisation of any chain of records or transactions without the need of intermediaries,” he had said. 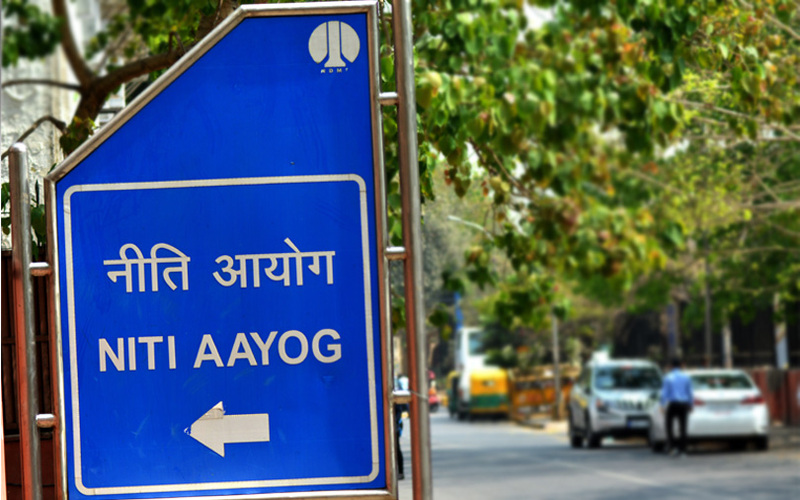 This week, a senior official of Niti Aayog had said the think tank was looking to tap IIT-Delhi's artificial-intelligence tool that reveals and predicts socio-economic conditions of areas right down to the district level using satellite images. In January, Niti Aayog had said that it was looking to explore the use of blockchain in several key sectors such as agriculture, health and education.